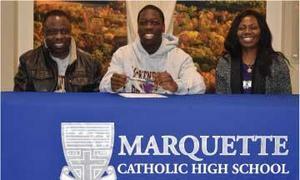 Letter of Intent to play soccer for McKendree University in Lebanon, Illinois. Family, friends, and teammates filled the Marquette Commons to support Kwame as he signed his Letter of Intent to become a Bearcat next year. The boys' team has had great success during Kwame's four years, ending this year with a 14-3-4 record. 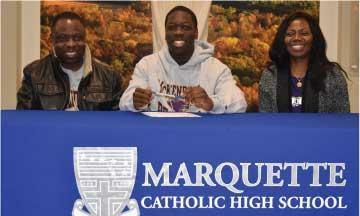 As a junior, Kwame kicked the winning goal in the second overtime to win the IHSA State Championship.